It is approximately 21" in circumference and will fit most toddlers and girls. Shades of pale pink, brown and ivory ad visual interest to the spring pink color. I used a variety of materials to add texture, dimension and visual interest. 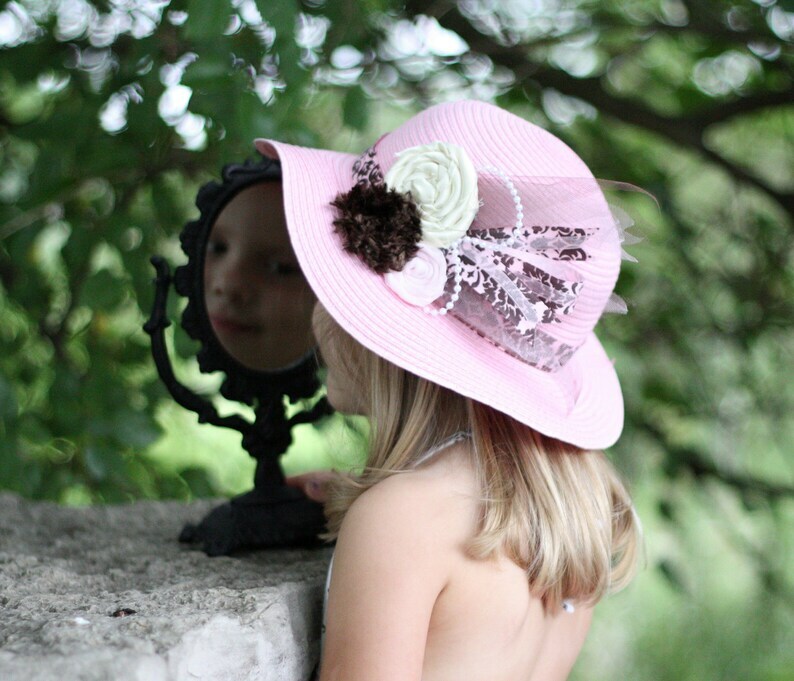 I have added a thin elastic chin band to secure the hat for little ones or windy days. Please allow 4 days for your order to ship as this item is made to order. My shipping policy for the straw hats is different from all others in my shop. To best maintain shape and integrity of the hat, this item ships boxed Priority Mail. In an effort to keep shipping costs as low as possible, I do not offer combined shipping on this item although Etsy lists additional items as $0 for combined shipping. If you wish to order other items in my shop, please do so in a separate order and transaction. Other items ship First Class USPS and combined shipping is available for all other items in my shop. If you do require Priority Mail for other items in my shop simply convo me. I am more than happy to make a custom listing for you with accurate shipping costs. See many other products in my shop at www.etsy.com/poshpipsqueak. Like my facebook page at www.facebook.com/poshpipsqueak for a sneak peek at new products and exclusive coupon codes.